THE Socceroos have jumped seven places in FIFA's world rankings to 43rd after their World Cup qualification victory over Syria. 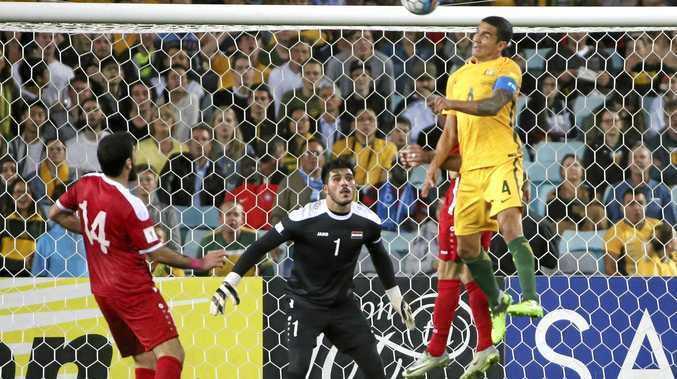 Australia recorded 1-1 and 2-1 results over the 77th-ranked Syrians this month, setting up another two-leg play-off against Honduras for a spot at Russia 2018. It's the highest ranking for Ange Postecoglou's men this year, reflecting their progression to the final stage of qualification with another nine spots still to be decided in play-offs. The Socceroos dropped five places to 50th in the previous rankings update in September after a 2-0 loss in Japan and 2-1 win over lowly Thailand. Honduras climbed from 74 to 69 after finishing fourth in CONCACAF qualification thanks to a 1-1 draw with Costa Rica and 3-2 win over world No.16 Mexico in October. World champion Germany continues to top the world, a position the country has held since last month. Germany, Brazil, Portugal, Argentina, Belgium, Poland and France join hosts Russia as seeded teams in the December 1 draw for the World Cup in June-July. Peru is into the top 10 for the first time, climbing two places to 10th before an intercontinental play-off against New Zealand, ranked 122nd. FIFA WORLD RANKINGS: 1. Germany, 2. Brazil, 3. Portugal, 4. Argentina, 5. Belgium, 6. Poland, 7. France, 8. Spain, 9. Chile, 10. Peru.